So we are off to an excellent start with DevLearn. As always at the first day of a guild conference it was an exhilarating day. I was able to attend some sessions and keynotes and talked to lot’s of people. Here is my wrap-up. I try to spot the emerging trends at conferences like this, for this conference there are two. One is SaaS or cloud based solutions, the other is the future of the Learning Management Systems. Acceptance for cloud based solutions is definitely growing, almost all the vendors have plans in that direction. The other trend is that the LMS market is changing rapidly. The big thing here is TinCan. I wrote about it before. Yesterday it became even bigger. Before the second keynote there was an extra unplanned presentation by Aron ‘TinCan’ Silver. He showed a video where AICC announced that they will adopt TinCan. I don’t think that the entire audience grasped the meaning of this announcement. We have two main standards in our industry SCORM and IACC, both of them enable us to track and trace results, both of them confine eLearning within the borders of the LMS. TinCan will free us from this, it allows you to track and trace any learning experience, anywhere. I don’t know what the adoption will actually mean but it sounded like TinCan will be the next version of IACC. This leaves us with one standard and but more importantly it ‘frees’ eLearning from the boundaries of the LMS. This really is a big thing and it will affect the way we use any LMS and in the long run it will change the market completely. We will see how this develops, but I’m exited. A morning buzz session I attended, presented by Art Kohm. It was about how to improve memory retention. His story was along the lines of the keynote of last year by John Medina at the Learning Solution conference. The brain filters information (to prevent information overload), in principle you forget the most information that you encounter, you need to reactivate the facts in order to really store them in your brain. He refers to research by Rodigger. His solution is Booster training. Two days after the learning event you have to trigger the information by asking (multiple choice questions). It forces you to retrieve the information and that will enhance the retention. After two weeks you have to do that again. The interesting here is that in this phase he will ask open questions, that not only require retrieval but also processing of the information. I believe that memory retention is a sort of blank area in eLearning, there are some tools but the notion isn’t widely spread. Ans it is important it determines the effectiveness of your Learning experiences. Brent opened the first session. He is the driving force behind DevLearn, but he has accepted another job. So this conference is his last one. It will be interesting to how this affects future conference. He spoke briefly about all the elements of the conference. John is the producer of many movies, the most famous ones are Titanic and Avatar. Great presentation. His message is that the story precede the technique. The technique to shoot the scripts of these movies wasn’t there when the scripts were written. They just developed the techniques they needed. According to him the same goes for eLearning. Make the learning experience leading and then just make it work. Great keynote. After the keynote I presented the launch of easygenerators free edition. I had a good turnout and great responses. It is great to see how the story about better eLearning courses catches on. More info at our website, you can register and start working within minutes. I joined this session because I am a scenario based learning fan, but this turned out to be a session about the posibilities of a product that let’s you create animated video’s with Lego images and text to speech voices. Looked ok, but is really not my thing. My second presentation of the day about learning objectives and how you can use the in many ways, but most importantly how to use them to connect learning to your business goals. I really enjoyed giving this presentation. Good crowd, good responses. A session by Jenet Clarey of Bersin. I was triggered by the term agility. It turned out to be something very different. She was talking about trends in the LMS market. She says that the trend is that it is changing rapidly. The core function of LMS was track and trace and course management. 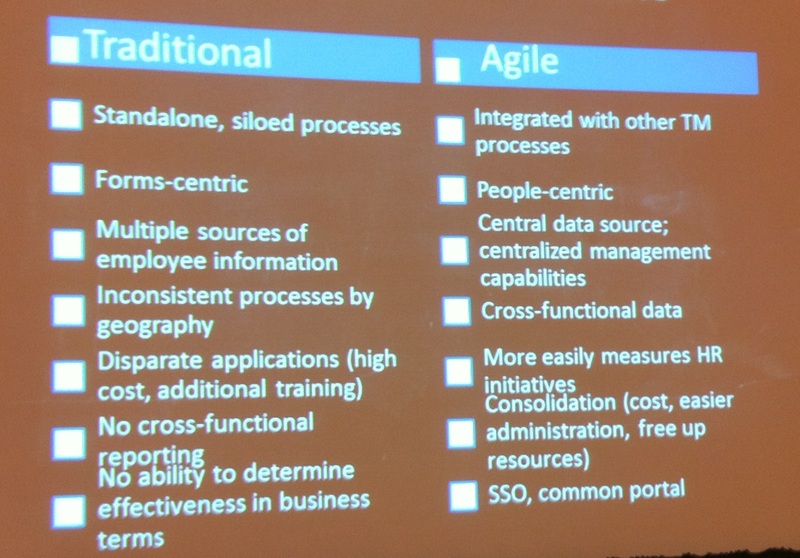 In the ‘Agile LMS’ it is just one of the functions. It grows to become a broad talent management system or even a corporate portal where learning is just a part of. I have two photo’s of interesting slides. 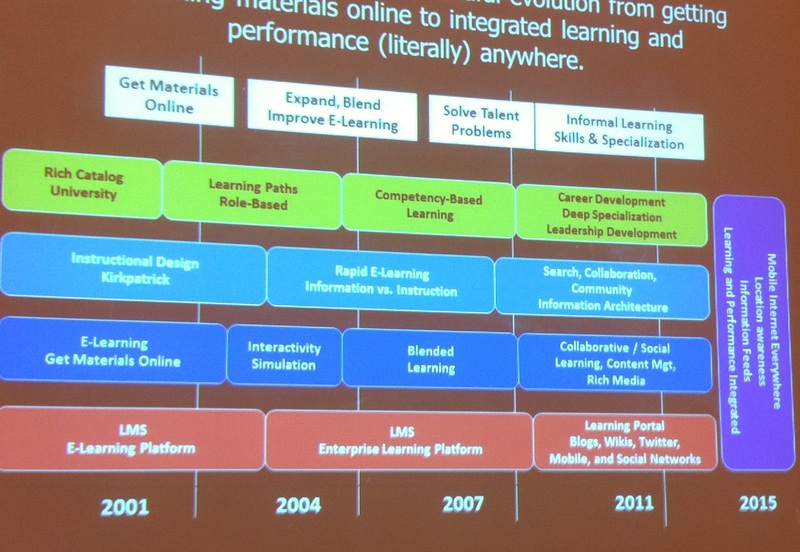 I think they tell a large part of the story, again a story about the changing LMS market. Brian Bushwood, how to scam your way to the top. Identify one niche and own it, be first at least in your category or in the minds op people. His niche was internet magician and it is great to hear and see how he made it to the top of his market. More to come tomorrow. Make sure you check out the curated backchannel of Devlearn by David Kelly. Julie Snyder #Devlearn keynote. What makes a story captivating?